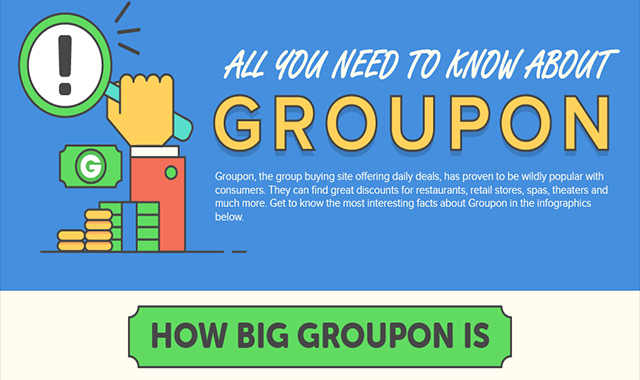 All You Need to Know About Groupon #infographic ~ Visualistan '+g+"
Coupons, daily deals, and discounts have become an essential part of the modern shopping practices. And no other company has embraced coupons more than Groupon. For those of you who don’t know, this is the biggest coupon website in the world and Groupon’s daily deals are the go-to place to discover discounts for many. They have around 50 million active customers, and they sell over 90,000 coupons each day. Groupon has deals for everything you can imagine, from restaurants and jewelry shops to clothing lines and electronics. So, regardless of what you are looking for, you will be able to find the best products with excellent deals for them.